Provide comfort for the family of Rhoda Pottinger with a meaningful gesture of sympathy. Passed away peacefully entered into rest at the St. Lawrence Lodge on Saturday, March 30, 2019. 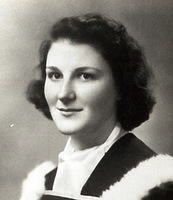 Rhoda Jeanne (McLean) Pottinger, at the age of 99 years. Beloved wife of the late Thomas Pottinger and loving mother of Donna Steinburg of Brockville. Cherished grandmother of Jennie (Jesse) Hill of Kingston and Sara (Trever) Proux of Ottawa. Devoted great-grandmother (GG) of Hailey and Katlynn Murray and Noah Hill. She will be sorely missed by friends Allen Steinburg and Mary Nerlich. By request of the family there will be no visitation. Arrangements entrusted to Irvine Funeral Home, 4 James Street East, Brockville. As expressions of sympathy, donations to the Alzheimer Society will be gratefully acknowledged. Send condolences or make a donation online at www.irvinememorial.com. We encourage you to share your most beloved memories of Rhoda here, so that the family and other loved ones can always see it. You can upload cherished photographs, or share your favorite stories, and can even comment on those shared by others. 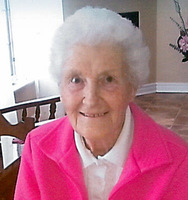 Provide comfort for the family of Rhoda Jeanne Pottinger (McLean) by sending flowers. My sincere condolences to Donna and family. Aunt Rhoda was my dad's youngest sister ~ I have many wonderful memories of McLean family gatherings. Rhoda became a wonderful friend to my mother,Rose Herdman, after she moved to Brockville and they both worked at the Book Store on King Street in the 70’s and 80’s.Many Friday nights they enjoyed Liver and Onions , both of their favorite dinners, at Diana Sweets after their day was over. I hope they are reunited and reliving those special memories. Always know how much your families love and miss you both.